Information on hard to evaluate gun types. i.e., Antique flint & percussion guns by small makers, Trade name firearms, small european revolvers, custom guns, non-factory commemoratives & historically attributed guns. TYPE – Long gun or hand gun? Is it a muzzleloader or does it take shells? If it’s a handgun, is it a revolver (with a rotating cylinder holding the rounds) or an autopistol (with a removable magazine)? If a long gun, is it a shotgun or rifle? ACTION – What type of action does it have – single shot, break-open, double barrel, bolt action, pump action, lever action, revolver, semi-auto, other? 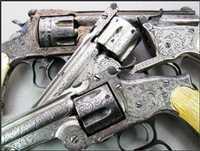 Double or single action? Exposed hammer or hammerless? If revolver, solid frame, tip-up, top-break, or swingout cylinder? MEASUREMENTS – barrel length, overall length. MARKINGS – if you know the make & model, say so. Either way, list ALL markings on the gun. After you know WHAT it is, the biggest factor in value is the CONDITION of the gun. Differences in condition can EASILY halve or double the value of a gun. This is a somewhat technical evaluation, and if you’re not familiar with guns, you probably won’t be able to do it, and should ask help. There are two systems commonly used . The NRA CONDITION STANDARDS rate modern guns as New, Excellent, Very Good, Good or Fair, and antique guns as Excellent, Fine, Very Good, Good, Fair, and Poor. Each condition rating has a specific definition (you can find these defined in Blue Book of Gun Values). 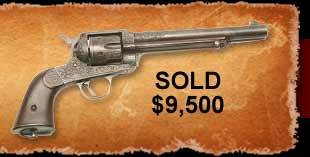 The PERCENTAGE SYSTEM rates the percent of original finish remaining on the gun, 100% to 0%. 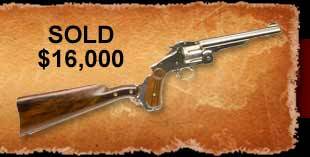 Refinishing a collectible gun or modifying it or customizing it or over-cleaning it nearly always lowers the value. NEVER take it upon yourself to clean up an old gun unless you know what you’re doing. I’ve seen folks buff a $2,000 gun into a $200 junker! Find definitions of NRA Conditions Grading Standards, and more information on rating gun condition. Blue Book of Gun Values by Fjestad, uses the percentage system, good for modern guns, no pictures. Standard Catalog of Firearms by Schwing, uses "Excellent" through "Fair" rating system, lots of photos, good all around guide, but BEWARE that their "condition definitions" for antique guns are radically different from the widely accepted NRA antique condition definitions! 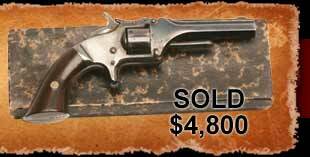 Flayderman's Guide to Antique American Arms – absolutely the best for antique American arms. R.L. Wilson's Official Guide. – can be helpful for oddball guns not listed in the others. Standard Catalog of Smith & Wesson - by Jim Supica & Richard Nahas. With no false modesty, the best price guide for S&W's. Remember that these list RETAIL prices. Expect a dealer to offer you 40% to 70% of these if he’s buying for resale. You can also get help with most questions at the rec.guns newsgroup, or at AOL’s Gun Talk forum (keyword "Guns"). You can also take your gun to a gun show and walk it around asking opinions, but remember that some opinions may be from folks who want to buy your gun as cheaply as possible. Armchair Gun Show gun site links - other interesting & helpful firearms websites. The newstand publications Shotgun News and Gun List also list guns for sale for comparison pricing. Most top-break or solid frame .32 & .38 DA revolvers by firms like H&R, Iver Johnson, US Revolver, Secret Service Special, Hopkins & Allen, Forehand etc. Most bring $40 to $125. A truly "as new" gun in the original box can bring more. Top-breaks by S&W can bring more, and large frame .44 & .45 caliber S&W top-breaks can be very valuable. Foreign copies of S&W's do not bring nearly as much as original S&W's. Many (but not all) double barrel shotguns w/ damascus barrels have relatively low values. Damascus barrels have a "twist" or "laminated" pattern in the steel, and are generally unsafe to shoot with modern ammunition. They are primarily "wall hangers" or "decorators". About 95% of these will retail in the $100 to $300 range. 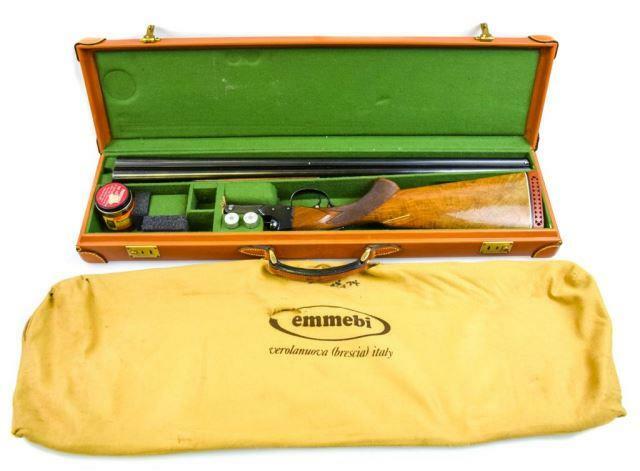 This range includes most well-worn, plain grade double barrel muzzle-loading shotguns, as well as those which break open to take shotshells.